For more than 140 years, the Johns Hopkins University's research and work has guided society through uncertain times. That same legacy threads through this program as students use the latest analytics tools to study risk from multiple perspectives in our newly STEM-designated Master of Science in Business Analytics and Risk Management program. The MS in Business Analytics and Risk Management program equips managers to improve decision-making processes based on a rigorous treatment of data and information using the management of risk as the underlying guide and framework. This program is designed to teach ways to: quantify multiple dimensions of hard business problems; analyze the structure and data related to those problems; and to create rigorous approaches based on that analysis to respond to problems. In each setting the management of the risks inherent in the business serves as the motivation and guide for the analysis. Coursework provides exposure to a variety of analytical tools along with many areas of risk management and integrates the concepts to enable managers to make better decisions for themselves and their organizations. Improve decision making at all levels of the organization. The MS in Business Analytics and Risk Management can be completed full-time at the Carey Business School's Washington, D.C. center. Starting Fall 2019, our MS in Business Analytics and Risk Management full-time program will be a STEM-designated program, offering an Optional Practical Training (OPT) STEM Extension benefit that allows international students to apply to work and stay in the U.S. for an additional 24 months. Learn more about STEM OPT eligibility. The full-time, 36-credit MS in Business Analytics and Risk Management degree program includes the following courses. Students should consult with their academic advisor as course sequence and availability may vary. Descriptions for the following courses can be found in the JHU Student Information System Course Search. The curriculum below is for students entering in the program in Fall 2019. Current students should refer to their handbook for their curricular requirements and course information. The most recent MS in Business Analytics and Risk Management career data is available here. 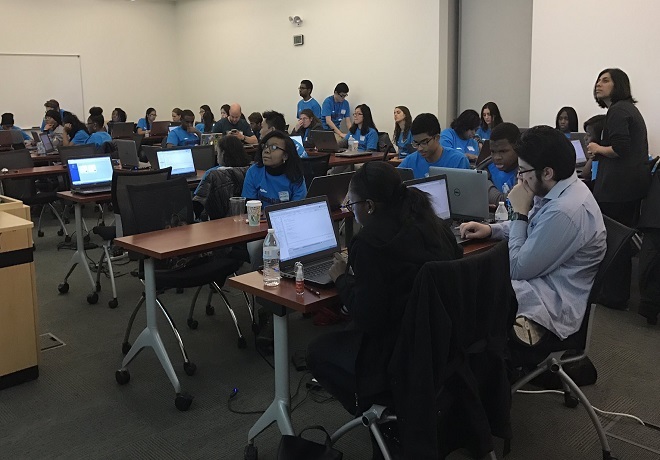 The Carey Business School partnered with Baltimore high school students for the third annual HackCarey hackathon event.